When you meet Amy, it’s her sweetness that strikes you first. Softly curling hair, a cute little indent in her cheek, and a gorgeous smile. But don’t let her looks fool you – we’re talking about one of the creative masterminds behind the digital Louis Vuitton campaign. And no, she didn’t get any free bags. Trust me, La Mom asked. Despite the lack of merchandise, leaving New York for a plum job in Paris was a pretty sweet deal. When she wasn’t working on one of the world’s most coveted brands, she was working on one of the world’s most coveted cities. Her memoir, Paris, My Sweet, traces her years as an American in search of pastry Nirvana – with snippets of real life woven in along the way. What's your sweetest Paris memory? I don’t think I have one favorite memory, but rather two camps of collective memories. The first are those little moments out in the streets, when you’re just walking along and your senses are so highly attuned to the sounds around you. I used to love hearing the clatter of dinner being prepared in some upstairs kitchen, or children’s voices echoing in a courtyard—it was like being privy to the most beautifully intimate moments. My other favorite moments are of Vélibing around town. 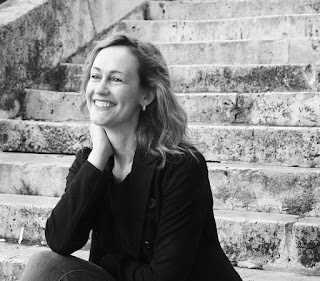 I remember biking home late one night through the Marais: the streets were quiet and empty, the moon hung in the sky, and I felt as blissed out as an eight-year-old on a sugar high… just profoundly happy. What's your favorite French sweet treat? This is the world’s most difficult question to answer. On a cold day, my favorite sweet treat might be chocolat chaud at Angelina or Les Deux Magots. In the morning, I might opt for a pain aux raisins from Stohrer or one of Boulangerie Julien’s ridiculously rich and decadent croissants. If I’m in Saint-Germain, La Patisserie des Reves’ “La Folie,” a doughy brioche piped full of vanilla pastry cream and rum raisin is as divine as Pierre Hermé’s gateaux individuels. But one thing I’m certain to get on every trip to Paris is a Nutella crepe from any old street vendor. Yeah, it’s hard to beat the Vuitton mansion in Asnière—c’est extraordinaire! The home is as perfect as you’d imagine: sterling silver trays are used to serve afternoon tea. Come evening, cognac is swirled in fine crystal. There are exquisite stained glass windows, a grand pool table, a classy piano… the entire Art Nouveau home has been immaculately preserved right down to the giant sculpted head of Louis himself. Otherwise, you know, the digs at Versailles aren’t too shabby. Sweetest French kissers – Zee Frenchies or Les Américains? A kiss is a kiss is a kiss! If you’re standing on the bank of the Seine, or snuggling at a café in Montmartre, chances are it’s going to be a pretty magical kiss, whether eet’s from a Frenchie or Américain! 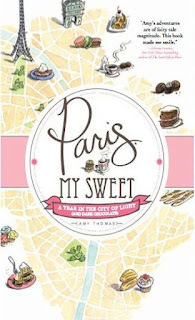 You can find the sweetest morsels in her memoir, but you can also satisfy your sweet tooth at Sweet Freak and God, I Love Paris. Amy's French adventures are over for now, but La Mom's betting Amy will be back. Because you can take the girl out of Paris, but you can never take Paris out of the girl. Love the interview! I can't wait to get my hands on this book! The story and the author are intriguing and the setting is perfection! So loving this book. Brings back memories, and increases my anticipation for my upcoming trip! I just finished her book last month - it's very good!